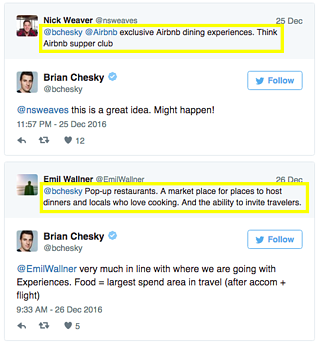 When Airbnb’s CEO asked his Twitter community for their Airbnb product wish list, what he got was a comprehensive look at what guests want from lodging today. 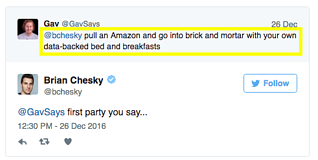 When Airbnb CEO Brian Chesky asked his Twitter followers for Airbnb product recommendations in the late hours of Christmas day, Chesky said he expected about 10 people to respond. Instead, some 2,200 people offered their suggestions, with product recommendations still coming in. Chesky spent the rest of the 25th, and then many hours on subsequent days, responding to input from users. The Airbnb CEO facilitated a wide-ranging conversation about short and longer-term product ideas for the company, and also fielded commentary about issues important to Airbnb’s future, like regulation and discrimination. User feedback has long been integral to Airbnb’s model. But this real-time user dialogue, initiated by the company’s CEO, and facilitated by Twitter is something new altogether. 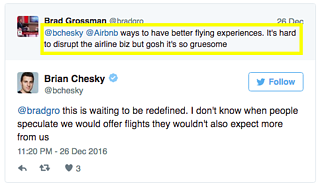 Reading these exchanges between Chesky and Airbnb users is instructive for hoteliers on many fronts. 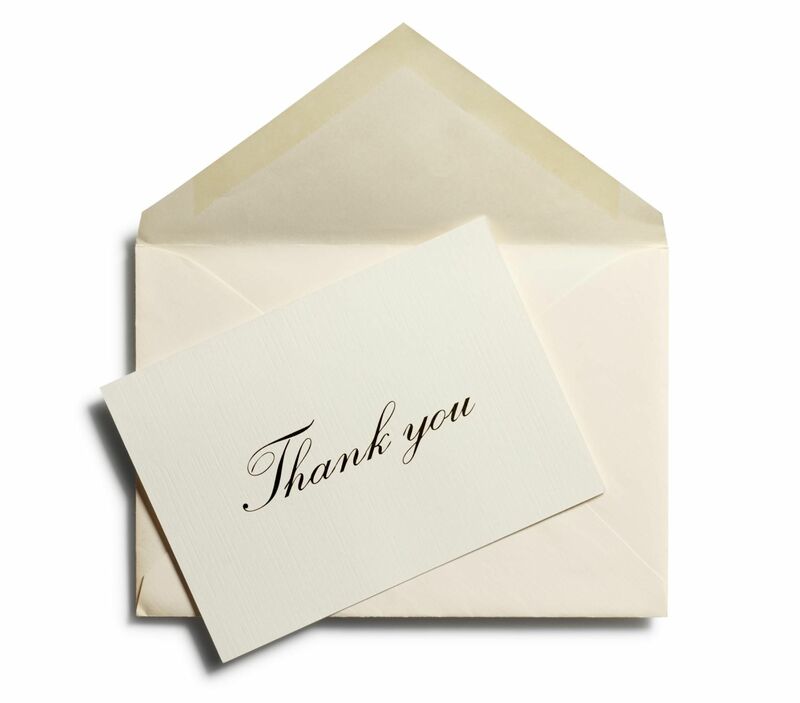 It is uncommon for CEOs of multi-billion dollar companies, in hospitality or otherwise, to solicit feedback from their users, let alone engage in such thoughtful, open and candid discussion. How can hotel management take a similarly direct approach to feedback, rather than rely on post-stay TripAdvisor commentary and largely ignored guest surveys that often feel like an afterthought? As the editors of Hotel Management put it, “One has to wonder if a hotel CEO asked the same seemingly innocuous question, would it bring the same kind of deluge of response? Had, say, Hilton Worldwide CEO Chris Nassetta asked on Twitter: ‘If @HiltonWorldwide could launch anything in 2017, what would it be?’ would it be met with thousands of replies? 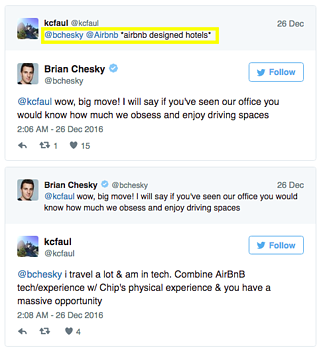 Better yet, would he have answered them?” Perhaps, as the leader of public company, Hilton’s CEO might not be able to take to Twitter in the same way, but Chesky’s question is a crucial reminder of the value in seeking feedback from your users or guests. This is especially true now that Airbnb - what many see as the industry’s biggest threat - has set this precedent, showing users its openness to feedback and eagerness to improve its product. 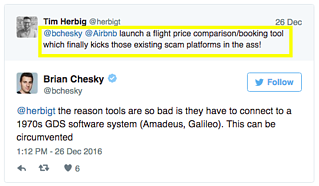 Chesky’s exchange with his users offers foresight for hoteliers, in that the discussion pointed to the CEO’s vision for the company long-term - a future in which Airbnb graduates from being a platform for lodging to a platform for all things travel. How will this affect the hospitality industry (beyond just hotels) in the long term? User suggestions for the company included financing options for homeowners, more service partnerships, tools for landlords and property managers, RV rentals, and disruption of the rental car industry. 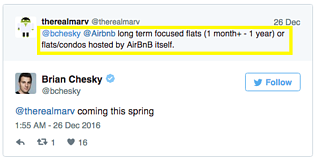 Chesky and his followers also discussed “Flights” - Airbnb’s much anticipated move into booking air travel, which Skift reported on last month. Flights would potentially give Airbnb an advantage over hotels in packaging deals, helping to engender more loyalty. But within lodging itself, the discussion also raised a number of trajectories for Airbnb that would circumvent some of the company’s recent regulatory hindrances, and, in so doing, threaten incumbents in more fundamental ways. Indeed, Airbnb has already started experimenting with first-party lodging. The company unveiled a communal housing project designed to revitalize a small town in Japan in August of last year. If successful, the company says it will scale this model to declining small towns across the world. 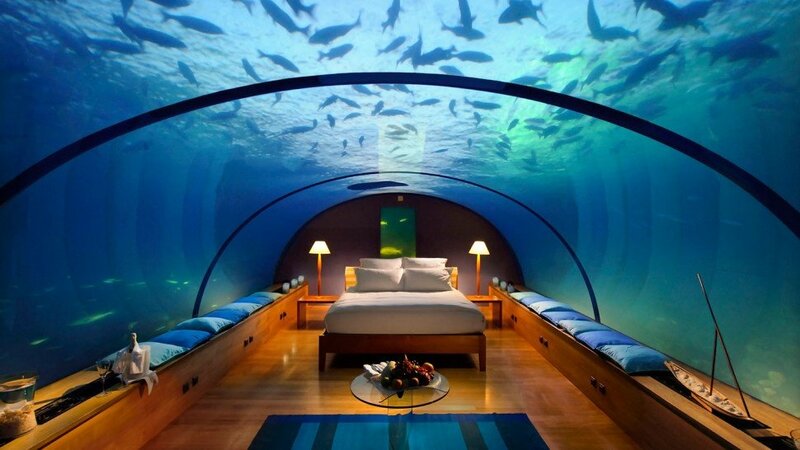 And we’ve speculated ourselves about what an actual Airbnb hotel might look like. The company’s platform approach to hospitality gives it several advantages should it decide to build or invest in its own hotels. Hosting its own long-term rentals specifically would circumvent many of the regulatory restrictions placed recently on the company, and reinvigorate its advance on traditional hotel demand. One particularly interesting aspect of the conversation was that a (possibly surprisingly) large subset of user recommendations had to do with ideas for Airbnb that are already hallmarks of hotels or innovations spearheaded by the hospitality industry more generally. These ideas included, but were not limited to, loyalty programs (complete with credit cards), business travel rewards programs, provision of amenities to guests (from gyms to shower gel), better corporate travel functionality, a stocked fridge, on-demand meals (aka room service), a true luxury segment with full-service treatment, eco-responsibility, and accepting Bitcoin for payment. Many users expressed a desire for quality controls and the institution of quality standards, pertaining to everything from the cleanliness of rental spaces to the speed of the WiFi. But hotels shouldn’t get too comfortable. 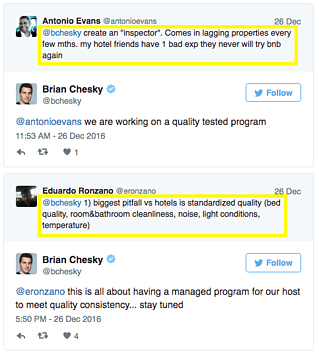 Chesky’s response to many of these product requests was either to directly or indirectly confirm that these popular features or characteristics of hotels would soon be coming to Airbnb. Hotels might have taken a collective sigh of relief after what’s seemed like a worldwide crackdown on Airbnb in recent months, but if this conversation is any indication, they shouldn’t get too comfortable. As the tweets above illustrate, many of the things that have formerly set hotels apart from Airbnb might soon be features of the Airbnb product. It’s imperative hotels continue to innovate and ask their guests what else they can offer to set themselves apart. To that end, it’s worth looking at the many user ideas for Airbnb that could improve the hotel offering as well. Users asked for ways to connect with like-minded travelers, Airbnbing in the same location. Many asked that this happen over food - either through shared cooking experiences, or by connecting with local chefs or foodies. As Chesky noted, food is the largest area of spend in travel after accommodations and flights. How can hotels capture some of this spend (especially since room service in the traditional sense is possibly being phased out) and connect their guests in so doing? (Other players in travel, like TripAdvisor acknowledge this growing trend, announcing this morning their integration with EatWith to power “social dining.”) And, dining aside, what else can hotels do to foster connections between like-minded guests? Similar to requests for ways to make connections between fellow travelers or with locals, many users asked for better functionality for group travel. Hotels often make it cheaper for two people to book together rather than separately, but how else can hotels reshape their offerings to appeal to guests who might be traveling in larger groups? Could hotels innovate by directly controlling group purchases and communication? Users also asked for more personalized local experience recommendations, based on user data, as well as app functionality that helped with arranging all aspects of travel, not just lodging. Frequent ALICE partners Hello Scout and Porter and Sail are growing players in the AI-driven concierge and travel planning space. How can hotels support their concierges with data-driven tools to improve guest recommendations? And can they expand their own (app or partnership) offerings to provide more comprehensive travel services to guests? Airbnb users also clamored for smart home features that would centralize control for Airbnb while also providing a better customer experience. Skift has identified the “Smart Hotel” as a guest experience trend for 2017. All eyes are on the innovators in this space, like the Wynn Las Vegas, which recently equipped every room with its own Amazon Echo smart speaker device. While hotels are often saddled with legacy in-room systems, Airbnb might have an advantage here, since homeowners are more likely to upgrade their spaces with the latest Amazon, Google, or Apple product, which is naturally integrated with the web. The openness of consumer electronics allows for integrating systems easily, potentially easier than enterprise versions. Airbnb already uses what it calls “smart pricing,” which modulates the price of rentals based on supply, demand, timing and other factors. One user suggested, however, Airbnb take these pricing manipulations even further by asking hosts for a minimum price and a “desired” price. 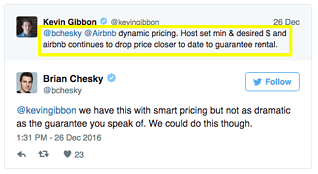 Airbnb would then drop the price of the rental over time to guarantee a booking. Hotels have long employed pricing variations to capitalize on their fixed inventory, and have gotten more comfortable with steep last minute discounts, in partnership with companies like Hotel Tonight, but there’s more room here for innovation. ALICE friend Beewake, and a host of similar startups, offer hotels the opportunity to make money from extra daytime capacity. How else can hotels using pricing to their advantage? Some users were critical of Airbnb’s approach to content marketing, encouraging the company to make more use of real, unscripted video and vlogging. Marriott has set a high bar for the industry with its marketing initiatives, which include experiments in virtual reality and 2015’s real-life, city-wide guest request simulation #AppYourService. What else can hotels do in marketing to set themselves apart? 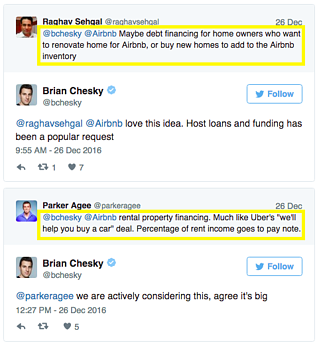 In the couple of weeks following Chesky’s conversation with Airbnb users, many other tech CEOs have taken to Twitter to ask their own customers for product ideas. Among those are Jack Dorsey, Twitter and Square (who asked his followers about both products), Jon Oringer, Shutterstock, Chris O’Neill, Evernote, and Brian Armstrong, Coinbase. It’s not surprising these are all companies actively disrupting incumbents in their respective spaces -- being actively attuned to customer needs and market opportunities is how these companies have set themselves apart and built customer loyalty, gaining market share in the process. Hospitality is an industry preoccupied with guest experience. But most hotels conceive of their loyalty programs as a way to lock-in guests, rather than endeavor to build real loyalty by listening to their customers. Brands that actively seek customer feedback have an incredible opportunity to gain market share. Brands focus on transactional loyalty instead of engagement may eventually lose their customers altogether. 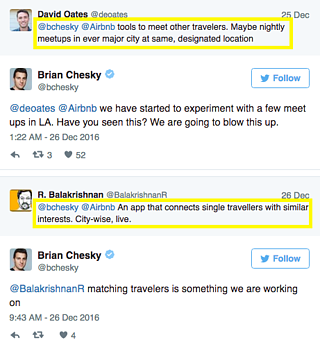 What would happen if hotel CEOs also followed Chesky’s lead and asked their guests about what they want? Would hotels get an opportunity to learn about the next generation of customer needs and distance themselves from Airbnb by innovating, just as the homeshare company is catching up? Would engaging in a genuine dialogue with their guests about what they want seed the future of a new breed of customer loyalty? It’s clear that if hotels don’t ask how to innovate, once Airbnb reaches parity with hotels, the company will surely be asking where to go next. And Airbnb will be bringing its customers -- and hotels’ customers -- with them.